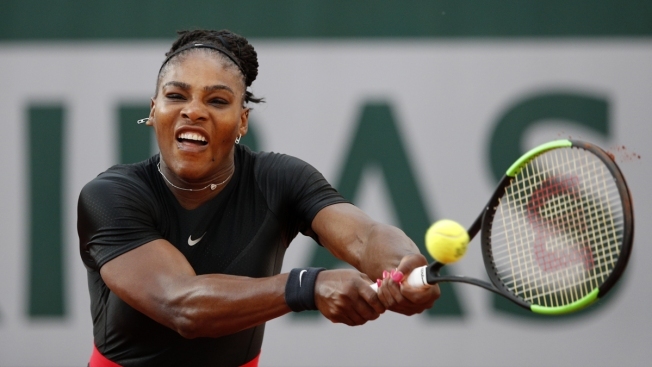 In this June 2, 2018, file photo, Serena Williams of the U.S. returns a shot against Germany's Julia Georges during their third round match of the French Open tennis tournament at the Roland Garros stadium in Paris, France. For the first time in eight years, not a single woman made it onto Forbes’ annual list of the world’s 100 top paid athletes, NBC News reported. Boxer Floyd Mayweather topped off the list at $275 million, while NBA players make up the majority of the list, followed by football and baseball players. Combined, they racked up $3.8 billion in the last year. In recent years, Serena Williams, along with fellow tennis players Maria Sharapova and Li Na, have made the list. But not this year. Forbes said Williams, the top-earning female athlete in 2018, likely lost her spot on the list because she gave birth last year and was was unable to earn as much prize money as years past.